Mihelcic, J.R and von Sperling, M. 2018. Collection and Conveyance of Excreta and Wastewater in On-Site and Off-Site Systems. In: J.B. Rose and B. Jiménez-Cisneros, (eds) Global Water Pathogen Project. http://www.waterpathogens.org (C. Haas, J.R. Mihelcic and M.E. Verbyla) (eds) Part 4 Management Of Risk from Excreta and Wastewater) http://www.waterpathogens.org/book/collection-and-conveyance-excreta-and-wastewater-systems Michigan State University, E. Lansing, MI, UNESCO. This chapter covers the potential for exposure to pathogens and some associated health implications associated with different on-site and off-site collection and conveyance excreta and wastewater systems. Readers interested in learning more about off-site conveyance can learn more about the fundamental hydraulic, chemical, and biological processes occurring in sewers and how they impact design, operation, and maintenance can find information in other sources (e.g., Hvitved-Jacobsen et al., 2013). 2) off-site systems that serve multiple households and a community. Figure 1 provides a quick comparison of such systems. All the different systems depicted in Figure 1 can lead to improvements in public health. On-site systems result in a larger number of dispersed conveyance points while off-site systems will have fewer conveyance points. However, if not designed, located, or managed properly, all the systems depicted in this figure can spread environmental pollutants and pathogens into neighborhoods and the environment. For centralized off-site conveyance systems, in many parts of the world only a small percentage of wastewater that is collected is conveyed to a properly designed and managed treatment plant. The remaining wastewater may be only partially treated or directly discharged into the environment without any treatment. In fact, approximately 85-95% of collected wastewater is now discharged to the environment without treatment in low resource countries, contaminating many waterways that impacts human health, economic well-being, and the environment (Connor et al., 2017). This is a reason Sustainable Development Goal (SDG) Target 6.3 seeks to halve the proportion of untreated wastewater. On-site systems can be a very effective way to safely manage human excrement, recover resources, or return water back to local watershed. However, they have been implicated with pollution of groundwater and/or surface water. For example, a study investigating nitrate (NO3-) contamination (a measure of excessive discharge of human excreta) of shallow groundwater near residential developments showed the concentration of nitrate in shallow groundwater is lowest in undeveloped areas and increases in residential areas served by sewers and then increases even more in residential areas served by on-site systems (MPCA, 2017). Also, if not properly designed, regulated, and operated, on-site systems situated below ground (e.g., unlined latrine pits, septic tank systems) can convey high loads of viable pathogens to the local environment. For example, on-site systems (in this case a septic tank integrated with a soil absorption system) have been found to contribute to faecal and other environmental contamination to groundwater and watersheds, especially at higher system densities (in these studies, > 15-87 on-site units/km2) (Yates, 1985; Sowah et al., 2017). Other studies have reported that a high density of on-site systems contribute to increase infection of diarrhea in children (Borchard et al., 2003). Feachem et al (1983) has also reported there is evidence that conveyance of excreta is partly responsible for the high levels of Ascaris egg contamination found in the soil collected in urban environments. On-site systems are unfortunately often neglected by regulators, managers, and homeowners, which can lead to system malfunction. Many on-site systems located in developed countries are reported to be operating at a lower level of performance because of lack of “adequate, consistent, integrated, and/or enforced regulatory control” (Withers et al., 2012; Gorman and Halvorsen, 2006). This is important because in many parts of the world (e.g., U.S., Europe, and Australia) 20-26% of households are served by on-site wastewater systems (Withers et al., 2012; EPA, 2014). Contamination of groundwater by microbial constituents is less likely to occur when the vertical distance between the bottom of the wastewater or excreta discharge system and the highest groundwater level is never < 2 meters and preferably > 5 meters, on either fine sand or clay soil (Pickford, 1995; EPA, 2002). However, there are other situations where on-site systems may lead to groundwater contamination. For example, when: 1) soil porosity is very high and/or the groundwater table is shallow; 2) population density is high with many small residential lots; 3) infiltration units that follow a septic tank are improperly submerged in groundwater or located close to a surface water (WHO, 2016). Studies suggest hydrologic exfiltration from a sewer may be 1.5 to 10% of sewer flow (Reynolds, 2003; Ellis et al., 2003). This may lead to groundwater contamination or interaction with leaks in drinking water distribution system if it is under low or intermittent pressure. Wastewater and stormwater are sometimes collected and conveyed in combined (stormwater and wastewater in the same pipelines) or separate (stormwater and wastewater in different pipelines) systems. Conveyance systems that separate these two sources of water are more common for newer systems, while combined systems are more common in older urban locations. Stormwater runoff from streets, yards, and other urban features does contain environmental pollutants (Sidhu et al., 2013); however, there are reasons a planner would want to separate domestic wastewater and stormwater. For example, a combined system can receive a very large volume of water during a storm event (that could be rainfall or melting snowfall). This wet weather flow can enter the combined conveyance system through stormwater catchments, roof piping, sump pumps, yard and foundation drains, and manhole covers. Ultimately, this wet weather flow can result in a conveyance system (or connected off-site treatment plant) receiving a much larger volume of water than it is designed for, thus leading to an overflow event. The combined sewer overflow (CSO) is then released with minimal or no treatment. Combined sewer overflows are a major water pollution problem in cities around the world and are associated with a wide variety of pathogens discharged to surface water (e.g., Geldreich, 1996; Gibson III et al., 1998). They are also recognized as a contributor to marine and freshwater litter pollution as municipal solid waste can enter stormwater collection systems. Improperly managed solid waste can block stormwater drainage pipes, leading to spills and even flooding. Sewer overflows are also important for public health because they often occur in locations with high public access and thus exposure (e.g., recreational beaches). They also may cause economic and social losses from impairment of receiving waters, beaches, and closing of shellfish beds. Green infrastructure that mimics natural hydrological processes can be designed into building and site development to reduce the damaging effects of increased stormwater runoff associated with urbanization that impacts rivers and streams. Examples include green roofs, bioretention systems, swales, and porous pavement (UNEP, 2014). Other options to manage combined sewer overflows are designing separate sewer systems to convey wastewater and stormwater, holding tanks, and storage tunnels. As written in the chapter on Sludge Management: Biosolids and Faecal Sludge, faecal sludge is a distinct type of wastewater sludge that is generated on-site (e.g., discharge to toilet/latrine pits and septic tanks) and is not transported through a sanitary sewer. Many references specifically address faecal sludge management (e.g., Strande et al., 2014; Semiyaga et al., 2015; World Bank, 2017). Faecal sludge that has aged in a pit or tank is expected to have reduced pathogen levels because of aerobic and anaerobic biological processes that occur in the pit (as long as the input of pathogens has been shut off so new pathogens do not enter the system). Furthermore, helminth egg concentrations can be very high in faecal sludge collected from toilet/latrine pits and septic tanks compared with wastewater (Semiyaga et al., 2015). There is potential for increased human health risk associated with exposure to pathogens present in the faecal sludge during the collection of the material and subsequent conveyance to a treatment or disposal facility. Thus, design and management of on-site systems (toilet/latrine and septic) must also consider safe and affordable collection and conveyance of the contents (Koné, 2010; Murray et al., 2011; Chowdhry and Kone 2012; Murungi and Dijk, 2014). In fact, less than one quarter of the faecal sludge produced in a twelve-city study was estimated to be safely managed. One reason for this is because as currently practiced, faecal sludge management is mostly unplanned and managed by nonregulated informal private entities (WSP, 2014). Important to this chapter, as the faecal matter moves through the sanitation service chain, there may be a large loss of it (and pathogens associated with the waste) to the urban environment before it reaches treatment and disposal. This example is not to say that decision makers should advocate only for centralized off-site systems. On-site systems can be managed properly, have a continued role to play in rural and urban settings, and offer flexible solutions and opportunities for innovation. 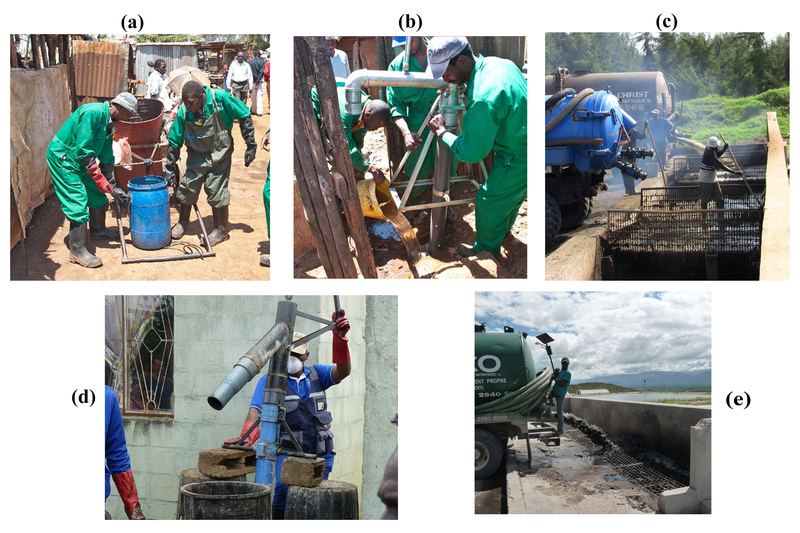 Figure 2 shows some examples of collection and conveyance of faecal sludge as practiced in some parts of the world. Strande et al. (2014) provide many design examples for technologies to manage faecal sludge. Table 1 summarizes several types of off-site conveyance systems and how these systems may impact public health. Table 2 provides similar information for several on-site systems. Table 1. Public health implications for off-site collection and conveyance systems. Open or covered drains (can be excavated in soil or lined with concrete). Exposure to pathogens is expected to be high, especially in open drains. Human and animal contact with pathogens found in waste can occur through direct or indirect contact in multiple locations. This system usually conveys untreated wastewater directly to local surface water which can result in high levels of exposure to pathogens through multiple routes of exposure. Underground sewers. Gravity and pumping are used to convey wastewater underground to an off-site location for treatment, safe recovery of resources, and disposal. Leakage can occur from fractures/breaks in the sewer, lateral pipes, joints, and connections, and open or damaged pipes. Gravel or sand layers that are sometimes placed below the sewer pipes for geotechnical support but can aid infiltration. Studies suggest transport of sewer contents may be 1.5 to 10% of sewer flow (Reynolds, 2003; Ellis et al., 2003). This may lead to groundwater contamination or interaction with leaks in drinking water distribution system if it is under low pressure. However, the impact on groundwater quality is reported to be variable (Eiswirth and Hötzl, 1997; Ellis et al., 2002; Rutsch et al., 2006). Other considerations that may lead to discharge of untreated wastewater (that contains pathogens) to the environment are: 1) Collected wastewater may not be transported to the treatment plant because of lack of trunk sewers and thus discharged without treatment. 2) In combined sewer systems, overflows related to storm events will discharge untreated wastewater and stormwater. 3) Separate sewer systems can receive stormwater from illegal connections, causing exceedance of the hydraulic capacity of the system and leading to overflows. 4) Stormwater sewers in separate sewerage systems can receive wastewater from illegal connections, which will not be treated. 5) Disruption of energy supply may lead to failures of pumping systems, leading to discharge of untreated wastewater. Disposal of excreta and greywater in yard. Sometimes unsafe disposal of excreta occurs in the yard and may even be combined with improper greywater disposal. Health impacts are large, and all household and community members may be exposed to greater health risk. When combined with greywater disposal, it may provide breeding ground for mosquitoes and conceal faecal matter if water is not assimilated quickly by soil. Container-based sanitation system for collecting excreta. Excreta is collected and conveyed in a sealable container that can be conveyed off-site for subsequent treatment and safe resource recovery and/or disposal. Example container sizes are 20-60 L.
Isolates household occupants and collectors from direct contact with pathogens in excrement. Health risk increases if users fail to defecate in the container, and excreta is carried by hands or foot traffic. Containers are conveyed to a treatment and/or resource recovery facility. Workers can minimize pathogen exposure by using appropriate personal protective equipment during collection and transfer at the point of treatment. Container-based sanitation system for collecting urine. Urine is separated from feces in a urine diverting toilet and is then stored in a container (e.g., 10-20 L). Urine is conveyed for direct use as a fertilizer or processed to recover nutrients (N, P, K) to use as a fertilizer. Urine can either be applied directly to soil for small scale farming (Shaw, 2010; Anderson, 2015) or collected and chemically precipitated to struvite (MgNH4PO4·6H2O) (e.g., Etter et al., 2011; Grau et al., 2015). In some cases, urine is conveyed directly to the subsurface by plastic tubing. Pathogen concentrations are lower in urine relative to feces, however, pathogens are documented to be present in people with a urinary infection or through cross-contamination of feces (Feachem et al., 1983; Stenström 2004; Bishel et al. 2015). There are also pharmaceuticals present in source-separated urine. Containers are transported for crop application or to a processing facility. Stored urine undergoes urea hydrolysis which results in increased pH levels and ammonia concentration which promotes inactivation of some microorganisms during collection and storage. However, pathogens (that includes viable helminth eggs, such as Ascaris, and infective phages) have been detected in precipitated struvite (Decrey et al., 2011). Guidelines are available for safe use of urine (e.g., Stenström, 2004). Manual handling and vacuum trucks are used to collect and convey faecal sludge. Workers employ manual and mechanized methods (e.g., handtools, manual and mechanized pumps, water desludging, vacuum trucks) to empty pits and convey faecal sludge to above ground storage for transport to a transfer facility or treatment and resource recovery facility. Conveyance off-site occurs by manual (human pushed cart), animal (donkey cart), or motorized vehicle. Spillage and leaks from hoses and fittings should be prevented to minimize homeowner and worker exposure to pathogens. Higher worker exposure is expected with manual collection (versus mechanical removal of contents) Faecal sludge that has aged in a latrine pit is believed to have reduced pathogen levels because of aerobic and anaerobic biological processes that occur in the pit. Helminth egg concentrations can be very high in sludge collected from pits (Semiyaga et al., 2015). Workers’ health risk can be through direct and indirect oral, nasal, and dermal exposure to multiple types of pathogens (Strande et al., 2014). Strande et al. (2014) provide details on several methods by which workers can minimize their exposure and also the exposure of house occupants. On-site discharge of excreta and household wastewater to an underground concrete vault that is sealed and does not discharge to subsurface environment. Disposal can also be to a septic tank which in contrast to a sealed vault, has liquid effluent that comes out of the tank. System needs to be regularly pumped (e.g., every 1-5 years) to prevent sludge accumulating in vault/tank and water filling up the vault which can lead to wastewater backing up into household drains. When emptying tank by manual and mechanical methods, spillage and leaks from hoses and fittings should be prevented to minimize homeowner and worker exposure to pathogens. Workers can minimize their pathogen exposure by using appropriate personal protective equipment. Their health risk can be through direct and indirect oral, nasal, and dermal exposure to multiple types of pathogens (Strande et al., 2014). Strande et al. (2014) provide details on several methods by which workers can minimize their exposure and also the exposure of house occupants. On-site management of household wastewater that integrates a septic tank with a properly sited soil absorption system (absorption bed or trench) for the septic tank liquid effluent. A properly functioning and sized septic tank allows solids to settle down to the bottom, forming sludge, while the oil and grease floats to the top as scum. Settled sludge is anaerobically digested and needs periodic removal. Baffles prevent sludge and scum from leaving the septic tank and traveling to the soil absorption systems (i.e., the drainfield). A soil absorption system allows discharge of septic tank effluent to a shallow, covered, excavation made in unsaturated soil. The septic tank effluent infiltrates vertically into soil, naturally removing pathogens and some other pollutants. Faecal sludge that has aged in a septic tank (without continuous input of excrement) is believed to have reduced pathogen levels because of aerobic and anaerobic biological processes that occur in the tank. Helminth egg concentrations can be very high in sludge collected from pits (Semiyaga et al., 2015). Technology as described here may lead to increase exposure in areas with high groundwater table, frequent flooding, and rocky soils. Septic tanks need to be regularly desludged (e.g., every 1-5 years) to prevent solids accumulation, which reduces treatment effectiveness. If the soil absorption systems (i.e., the drainfield) is overloaded with too much septic tank effluent, partially treated sewage may reach groundwater surface or back up into toilets and sinks. A septic tank connected to a soak away pit should have a lower level of pathogen removal compared to a properly designed soil absorption system (i.e., the drainfield). Agency, USEnvironmen (2014). Decentralized Wastewater Program Annual Report 2013. EPA-832-R-140006. Agency, USEnvironmen (2002). Onsite Wastewater Treatment Systems Manual. EPA/625/R-00/008. Bischel, HN, Duygan, BDÖzel, Strande, L, McArdell, CS, Udert, KM and Kohn, T (2015). Pathogens and pharmaceuticals in source-separated urine in eThekwini, South Africa. Water research. 85, pp. 57–65. Connor, R, Renata, A, Ortigara, C, Koncagül, E, Uhlenbrook, S, Lamizana-Diallo, BM et al. (2017). The United Nations World Water Development Report 2017. Wastewater: The Untapped Resource. The United Nations World Water Development Report. Decrey, L\"ıc, Udert, KM, Tilley, E, Pecson, BM and Kohn, T (2011). Fate of the pathogen indicators phage $\Phi$X174 and Ascaris suum eggs during the production of struvite fertilizer from source-separated urine. Water research. 45, pp. 4960–4972. Eiswirth, M and Hötzl, H (1997). The impact of leaking sewers on urban groundwater. Groundwater in the urban environment. 1, pp. 399–404. Ellis, JBryan and D Revitt, M (2002). 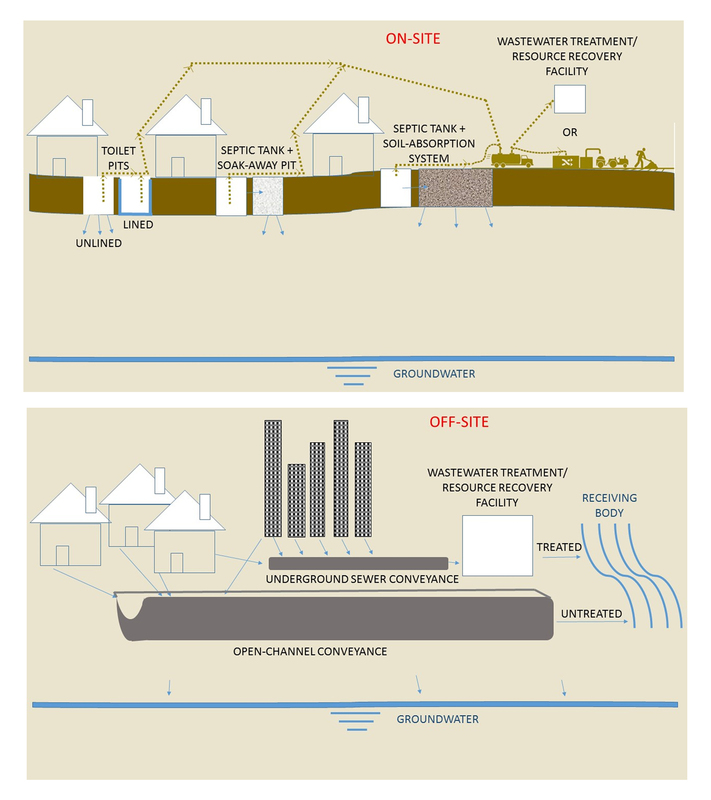 Sewer losses and interactions with groundwater quality. Water Science and Technology. 45, pp. 195–202. Ellis, JBryan, D Revitt, M, Lister, P, Willgress, C and Buckley, A (2003). Experimental studies of sewer exfiltration. Water Science and Technology. 47, pp. 61–67. Etter, B, Tilley, E, Khadka, R and Udert, KM (2011). Low-cost struvite production using source-separated urine in Nepal. Water research. 45, pp. 852–862. Geldreich, EE (1996). Pathogenic agents in freshwater resources. Hydrological processes. 10, pp. 315–333. Gibson, CJ, Stadterman, KL, Sykora, J and (1998). Combined sewer overflows: a source of Cryptosporidium and Giardia?. Water Science and Technology. 38, pp. 67–72. Gorman, HS and Halvorsen, KE (2006). The regulation of alternative onsite wastewater treatment systems in the Great Lakes Region. Small Flows Quarterly. 7, pp. 23–37. Grau, MGP, Rhoton, SL, Brouckaert, CJ and Buckley, CA (2015). Evaluation of an automated struvite reactor to recover phosphorus from source-separated urine collected at urine diversion toilets in eThekwini. Water Sa. 41, pp. 383–389. Kone, D (2010). Making urban excreta and wastewater management contribute to cities' economic development: a paradigm shift. Water Policy. 12, pp. 602–610. MPCA), MPollution (2017). Septic Systems and Ground Water Quality. Murray, A, Cofie, O and Drechsel, P (2011). Efficiency indicators for waste-based business models: fostering private-sector participation in wastewater and faecal-sludge management. Water International. 36, pp. 505–521. Murungi, C and van Dijk, MPieter (2014). Emptying, Transportation and Disposal of feacal sludge in informal settlements of Kampala Uganda: the economics of sanitation. Habitat International. 42, pp. 69–75. Organization, WHealth and (2016). Protecting surface water for health. Identifying, assessing and managing drinking-water quality risks in surface-water catchments..
Pickford, J (1995). Low-cost sanitation. London, UK: Intermediate Technologies. Reynolds, JH and Barrett, MH (2003). A review of the effects of sewer leakage on groundwater quality. Water and Environment Journal. 17, pp. 34–39. Rutsch, M, Rieckermann, J and Krebs, P (2006). Quantification of sewer leakage: a review. Water science and technology. 54, pp. 135–144. Shaw, R (2010). The use of human urine as crop fertilizer in Mali, West Africa. Sidhu, JPS, Ahmed, W, Gernjak, W, Aryal, R, McCarthy, D, Palmer, A et al. (2013). Sewage pollution in urban stormwater runoff as evident from the widespread presence of multiple microbial and chemical source tracking markers. Science of the Total Environment. 463, pp. 488–496. Stenström, TAxel (2004). Guidelines on the safe use of urine and faeces in ecological sanitation systems. UNEP, UNEP-DHI, IUCN, TNC and (2014). Green Infrastructure Guide for Water Management: Ecosystem-based Management Approaches for Water-related Infrastructure Projects. Withers, PJA, Jordan, P, May, L, Jarvie, HP and Deal, NE (2014). Do septic tank systems pose a hidden threat to water quality?. Frontiers in Ecology and the Environment. 12, pp. 123–130.